Stephen L. "Cookie" Sewell was born in New York State and is a retired US Army Chief Warrant Officer and Department of the Army intelligence analyst. He was trained in the Vietnamese and Russian languages and has been an active Russian linguist since 1974. He has also been an enthusiastic scale modeller since the age of 5 and has built numerous models of armoured vehicles, specializing in Russian, Soviet and American tanks and armoured vehicles. He was the founder of the Armor Model and Preservation Society in 1992. While author of numerous intelligence articles, he has also written extensively on American and Soviet armour and provided a great deal of information to other authors on topics that include Korean and Vietnamese air war activities. He lives in Aberdeen, Maryland. 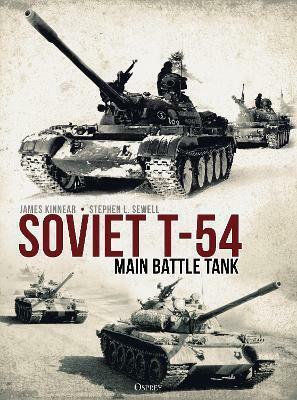 James Kinnear was born in Great Britain and has researched the topic of Soviet and Russian military hardware since his first visit to the Soviet Union as a young teenager. He subsequently lived and worked in the post-Soviet Russian Federation and the other states of the former Soviet Union throughout the entire period of post-Soviet "stability", the two decades between the Soviet Union being considered a military threat and the Russian Federation finding itself again categorized as such in recent history. James has written hundreds of articles on Soviet and Russian technology. He is a formal contributor to IHS Jane's defence yearbooks and has published books on Soviet military technology with Barbarossa, Darlington, Osprey and Tankograd.